So you’ve already met the Mertailor Eric Ducharme, who at the tender age of 21 has already been in business for six years crafting gorgeous mermaid tails out of his house in Crystal River, Florida, and has plenty of other tricks up his sleeve… including his latest project, THE MERQUEENS, which brings together drag queens and mermaids. It only makes sense, right? Who better to embody the gorgeous over-the-top exaggerated ultra-femininity of the mermaid than a fabulous drag queen, especially those featured in RuPaul’s Drag Race? Pretty fabulous, right? I recently asked Eric some burning questions about his new venture, and you may read our wondrous conversation below. 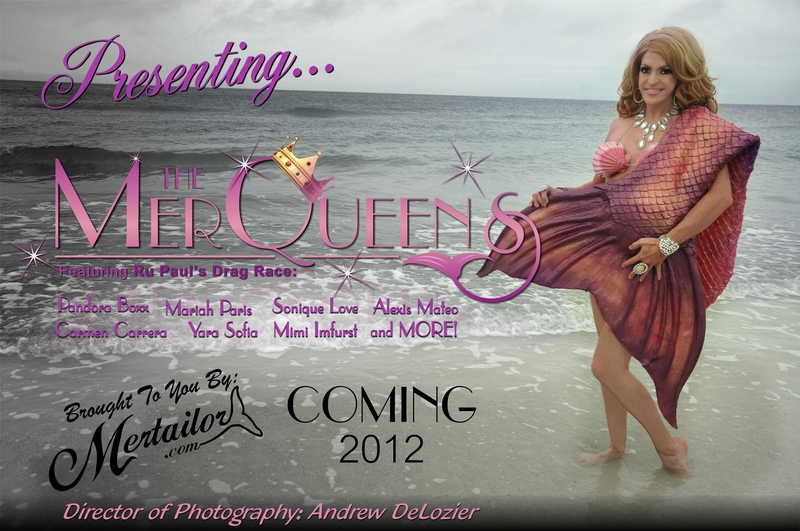 MerQueens is the first ever all drag queen mermaid calendar and photography series, coming in 2012. Drag Queens dressed in mermaid tails! Together the Mertailor and world famous drag queens featured in the television reality series RuPaul’s Drag Race come together to generate funding and awareness for a HIV/Aids foundation. This year’s calendar and photography series features Yara Sofia, Mariah Paris Balenciaga, Alexis Mateo, Carmen Carrera, Pandora Boxx, Jessica Wild, Sonique Love, Mimi Imfirst, Jade, and many more! What’s the link between drag queens and mermaids? This is kind of a difficult question to answer, but from my knowledge of drag queens, every queen tries to look like a beautiful woman. I believe a drag queen becoming a mermaid is like transforming into a beautiful woman, and assume it is kind of like every little girl wants to be a mermaid when they grow up. How did these particular drag queens react to being put in tails and transformed into legendary creatures? All of the drag queens that have put on the tails had no idea what they were getting themselves into. However, working with they girls from RuPaul’s Drag Race, they were all professional and ready to deal with every task put in front of them. What can we expect at Merqueens.com in months to come? The purpose of the website is to display many of the photographs and videos to promote and sell the one-of-a-kind calendar. This site will be updated with photos, promos, and release dates of the debut of the calendar. We’ll also be performing a special “Drag Queen Mermaid Show” throughout Florida. The calendars will be available for purchase at the venues that the show is being performed (as well as on the website), and a part of the proceeds being made will be donated to an HIV/aids organization for children born with the disease. And finally, do you have any advice for aspiring drag queen mermaids (i.e. merqueens)? Yes, come to me! I’ve wrangled enough merqueens to be able to give the best advice!